A number of Palestinians were reported injured as new clashes broke out across the occupied Palestinian territory on Saturday after three Palestinians were shot dead over alleged stabbing attacks. 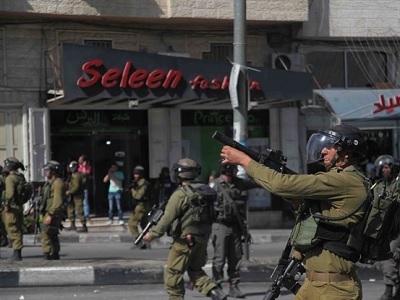 In central Hebron, Israeli forces shot and injured three Palestinians with live rounds and 15 others with rubber-coated steel bullets during clashes at the entrance to Shuhada Street and in the city’s the Bab al-Zawiya area, medics said. Another 25 Palestinians reportedly suffered excessive tear gas inhalation. Earlier on Saturday, 18-year-old Fadil Qawasmi was shot dead by an Israeli settler on Shuhada Street after he allegedly attempted to carry out a stabbing attack, although locals have disputed that Qawasmi was involved in any attack. Bayan Ayman al-Esseil, a 17-year-old girl, was also shot dead in the Hebron area on Saturday after she stabbed an Israeli border police woman in the hand. The Fatah movement in Hebron declared a day of mourning and several shop owners closed their shops in honor of those killed. During the clashes, dozens of Palestinian youths threw rocks at Israeli soldiers who responded with live and rubber-coated steel bullets, stun grenades, and tear gas canisters. Meanwhile in the Gaza Strip, dozens of Palestinians took part in a demonstration that marched from Al-Quds Open University in the Wadi Abu Kteila area to the Erez crossing in the coastal enclave’s north. The march was called for by the Democratic Front for the Liberation of Palestine, and clashes quickly broke out close to the border crossing. Several Palestinians suffered excessive tear gas inhalation, including a member of the DFLP politburo, Talal Abu Tharifeh, who was taken to the Kamal Adwan Hospital. Muhammad al-Madhun, an official in the Popular Front for the Liberation of Palestine in the northern Gaza Strip, also suffered tear gas inhalation. An Israeli army spokesperson told Ma’an they were not aware of any incidents in Hebron, and were looking into reports of clashes in the Gaza Strip. Some 40 Palestinians have been killed by Israeli forces since the start of the month, and seven Israelis have died in attacks by Palestinians in the same period. Those killed since this month include 12 Palestinians who fatally wounded during demonstrations and two killed in Israeli airstrikes — a pregnant mother and her two-year-old daughter. The Palestinian envoy to the UN last week requested that the UN deploy special security forces to occupied East Jerusalem to help quell violence, but Israel’s ambassador to the UN Danny Danon said on Friday that Israel objects to international oversight in the area.